AMTECH offers PTFE lined ball valves in FEP/FPA lining. Ball valves always bidirectional valves. The ball shaft in centre can be optionally connected to a pneumatic/electric actuator over an adapter or equipped with a manually operated lever. Ball is sealed in the PTFE lined body with exchangeable seat rings –PTFE . The ball shaft is sealed with a maintenance-free. Fail-safe position Depending on the version of the single-acting rotary actuator, the ball valve has two fail-safe positions which become effective when the actuator is relieved of pressure as well as when the supply air fails: Control valve CLOSED without supply air The ball valve closes when the supply air fails when single acting actuator.But in Double acting actuator valves required air supply to pen and close valve each time. 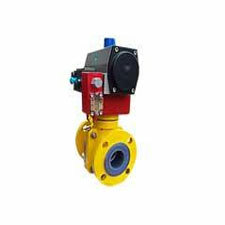 We have variety of materials of construction, two piece design valves, ASA 150#,PN10,PN 16.